Dainty yellow trumpets that resemble a hoop petticoat. 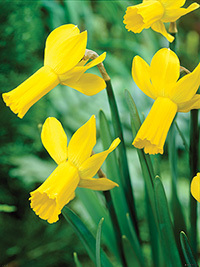 Timeless species daffodil naturalises readily. Very early-season flowering. 15 cm tall. 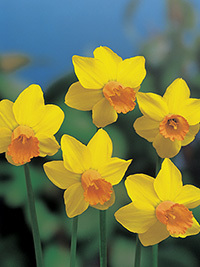 Bright yellow and orange colours with swept back petals in the true cyclamineus daffodil style. Early-season flowering. 25 cm tall. Miniature buttercup-yellow blooms that is sure to be a stand-out in the garden. 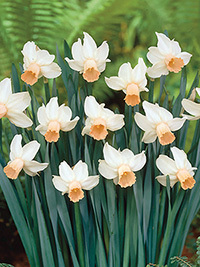 The World’s most popular potted daffodil. 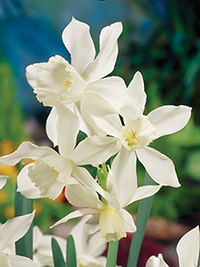 Prolific flower production with 3-4 stems from each bulb. Early-season flowering. 20 cm tall. 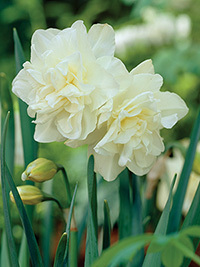 Beautiful pure-white daffodil. Has very long-lasting flowers and a wonderful fragrance. Mid-season flowering. 30 cm tall.